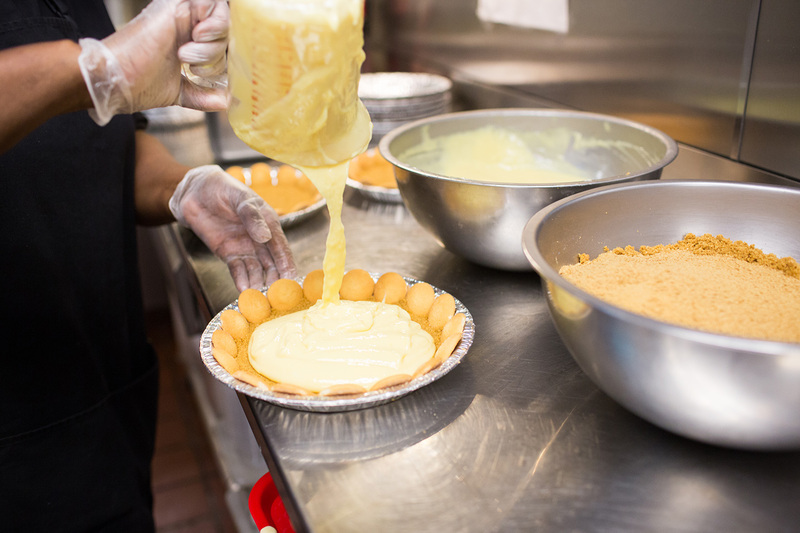 We are celebrating our heritage by sharing one of the classic Chick-fil-A menu items: The Chick-fil-A Lemon Pie. 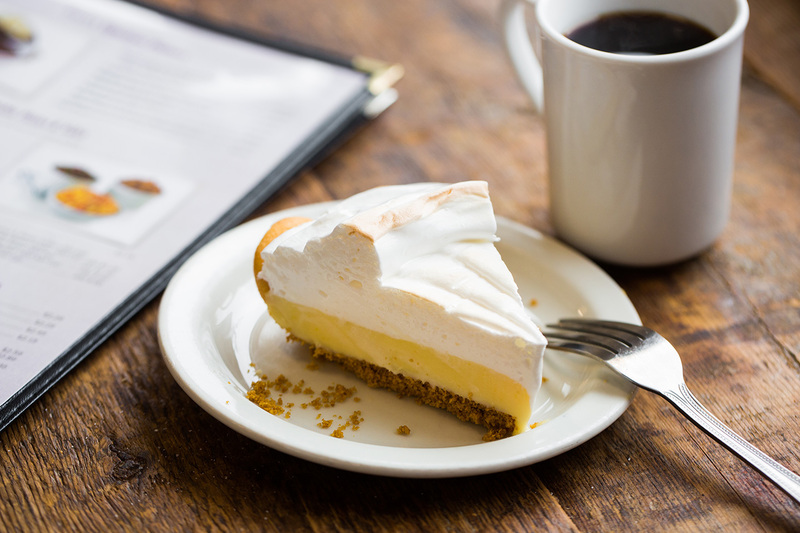 While it’s no longer on the Chick-fil-A menu nationwide, the made-from-scratch lemon meringue pie is still available at the Dwarf House in Atlanta, the first restaurant Chick-fil-A founder Truett Cathy opened back in 1946. It was originally prepared by Cathy himself and only two pie makers have followed in his footsteps in the restaurant’s 70 year history. We are excited to share the recipe for customers to make it to enjoy at home. The recipe is available below. Measure graham cracker crumbs into mixing bowl. Melt margarine Measure melted margarine into bowl with graham cracker crumbs and blend thoroughly using large spatula be sure to use margarine immediately after melting it so that it will blend well). Place graham cracker mixture into aluminum pie plate for base of the pie. Spread and pack mixture evenly over bottom of pie plate, using bottom of metal measuring cup. Stand vanilla wafers around the edge of each pie plate with flat side of wafer facing outside of the pan. Gently press each wafer into pie base. Make sure that edges of wafers are not broken. (Note: Usually 16 wafers will fit evenly around the perimeter of the plate. This allows for pie to be cut into 8 even slices, each with two wafers.) Set aside pie shell until it is time to fill it. Combine condensed milk and eggs in mixing bowl. Mix by hand with whisk until well blended. Slowly pour in strained lemon juice. Once all juice has been added, mix by hand for an additional 30 seconds. (Note: Lemons should be stored in refrigerator and squeezed just prior to use. Do not use lemon juice that has been frozen.) Fill pie shell with 2 cups of filling. Place filled pie shells in freezer until ready to be topped with meringue mix, If not topping right away. (Note: shelf life to pie shells held in freezer is 72 hours. )Combine egg whites, sugar, cream of tartar and vanilla in separate mixing bowl. Set mixer on low speed setting and blend for one minute. Turn mixer off and scrape edges of bowl with large spatula. Set mixer on second speed setting and blend for six minutes or until whip marks form in meringue mix. Turn mixer off and scrape bowl again. Set mixer on medium setting for 1 ½ minutes or until the meringue peaks. (Note: peaking is achieved when mixture remains stiff when pulled into a peak with the spatula.) Turn mixer off and disconnect wire whip attachment from mixer shaft. Lightly tap whip on edge of mixer bowl to remove excess meringue. Scrape meringue from sides of bowl with large spatula. Top pie with meringue mix. Remove pie from freezer. Cut pie in half using kitchen knife, then into quarters, and finally into eighths, with two vanilla wafers per slice. (Note: Place knife in hot water to rinse off crumbs and meringue between each cut. This will prevent crumbs from marring appearance of pie.) Shelf life for thawed pie slice is 48 hours.